Alvin H. Benson, a well-known Wall Street broker and man about town, was murdered in his home. He had been seated in a chair and had been shot through the head. Oddly enough, this vain man was not wearing his toupee or his false teeth. John F. X. Markham, district attorney of New York, started an investigation of this crime along with the city police. Markham brought along his friends, Philo Vance and S. S. VanDine. Van Dine was along as a sort of Watson to record Vance's exploits. A large part of this book is devoted to presenting Philo Vance and his philosophies of crime detection and the psychology of murderers. Vance "was an aristocrat by birth" and a "man of unusual culture and brilliance" He was good looking, well-dressed, and a member of the best clubs. Vance was quite knowledgeable about art and very well educated. "The great majority of those with whom he came in contact regarded him as a snob." I did find him a bit overbearing. During the initial visit to the crime scene, Vance was able to deduce the height of the murderer, and identified two cigarettes by their tobacco. At the crime scene were found the gloves and handbag of Muriel St. Clair who apparently had visited the house that day. She was engaged to Captain Philip Leacock who had recently had a public argument with Benson. Further investigation would reveal others who had an interest in the fate of Benson including his brother and business partner, Major Anthony Benson, and Alvin's housekeeper, Mrs. Platz. During the whole book, Vance states that he has know from the beginning who the murderer is. He observes the fumbling efforts of Markam and the police to solve this murder. At the end, he details how each person who was involved with Benson could have committed the crime and how he (Vance) eliminates them from consideration. Finally he reveals who the real murderer is and how the crime was committed. This book, which was published in 1926, is the first of the series of Philo Vance mysteries which all have a 6 letter word in the title except for The Gracie Allen Murder Case. S. S. Van Dine is the pseudonym of American art critic Willard Huntington Wright. The book is currently available in paper and e-book form. 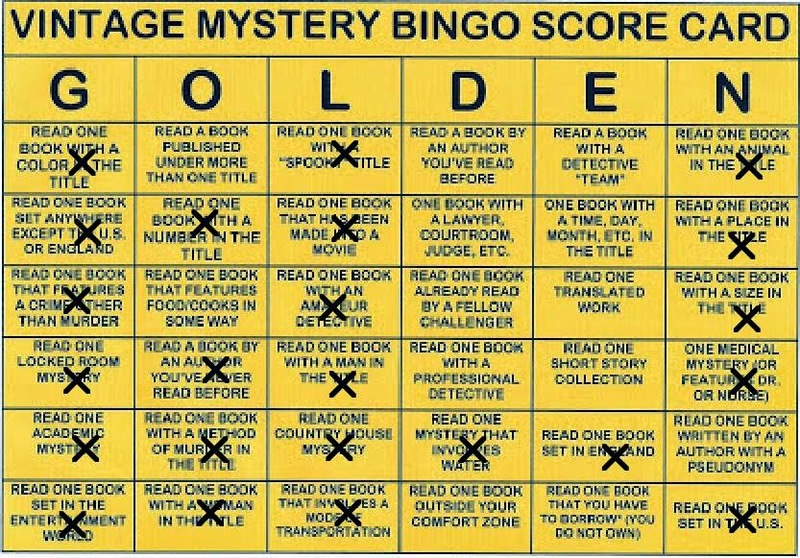 I have read this book for the Vintage Mystery Bingo in the category of a book set in the United States.